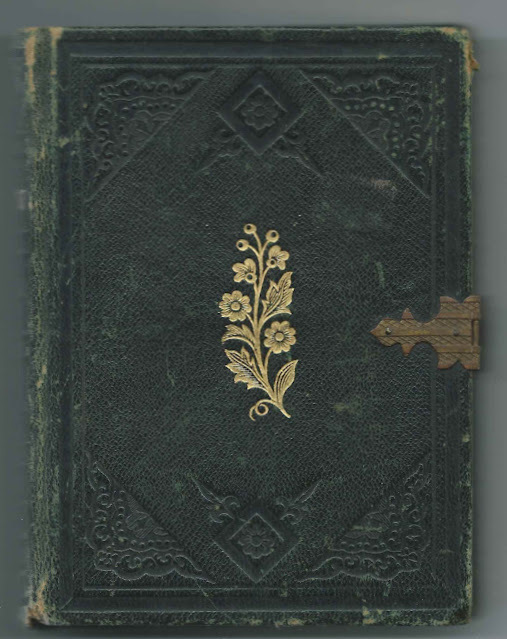 19th Century Photograph Album of Ohio Families: Reed, Frasher, Popham, Kuntz, etc. Note of March 2019: A reader has provided additional information on Thomas Popham and Lydia (Britton) Popham; see their photographs below - the additional information appears in bold. Nineteenth century photograph album containing cabinet photographs, cartes de visite and tintypes by mostly Ohio studios, with others from Kansas and Pennsylvania. The predominant surname is Reed from Mt. Vernon, Ohio; Nevada, Ohio; and Wooster, Ohio. 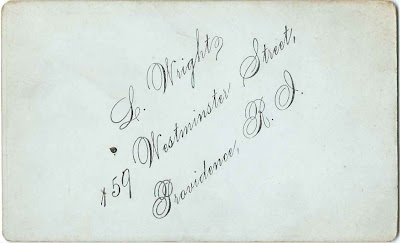 One caveat: in one case, the name written on the page did not match up with the name written on the back of the photograph; hopefully that was an anomaly. An alphabetical list of people identified in the photographs - some are in more than one - appears at the end of this post. 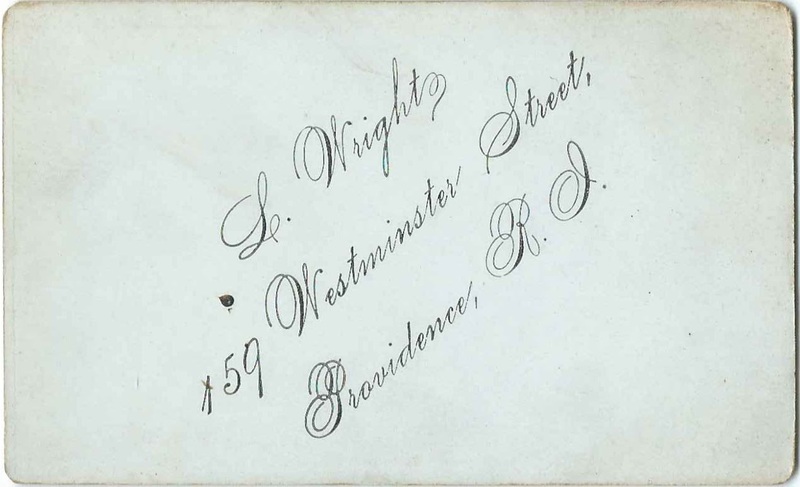 Below, Mrs. William Frasher [her name is written faintly at the bottom of the album page]. Could she have been Mary C. (Butcher) Frasher, second wife of William Harrison Frasher? The reader also noted that Thomas and Lydia had a daughter Mary, who died in infancy. Thomas married again in 1900, to Margaret A. Johnson. If you have information on any of the people identified above or in the list below, please leave a comment or contact me directly. Cabinet photograph of an unidentified woman; no studio imprint. Page has the identification of Squire Fletcher Family but the pocket is empty. I wonder if Squire was Squire D. Reed. Cabinet photograph of an unidentified young child; no studio imprint. Mrs. William Frasher; cabinet photograph by the Miller studio of Mount Vernon, Ohio. 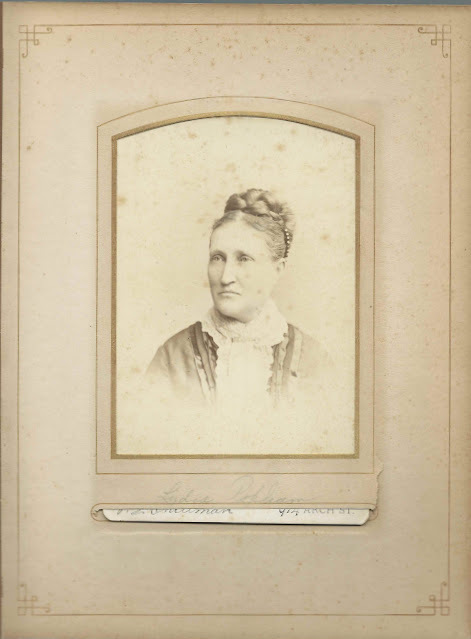 Could she have been Mary C. (Butcher) Frasher (1838-1931), second wife of William Harrison Frasher (1812-1897)? A. J. Frasher; cabinet photograph by the Wark studio of Mt. Vernon, Ohio. His photograph faces that of Flora Reed, taken at the Ward studio of Mt. Vernon, Ohio. They were Andrew Jackson Frasher and his future wife Flora Mae Reed. 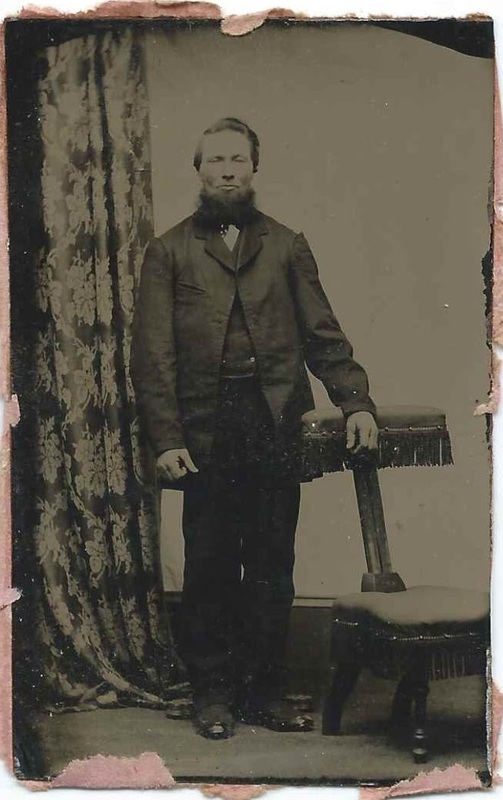 A. J. Frasher; tintype; no studio imprint. Presumably Andrew Jackson Frasher, who married Flora Mae Reed - also shown in this album. Ella Grice; cabinet photograph by the Star & Crescent Art Gallery at 137 South Main Street, Mt. Vernon, Ohio. Cleo McLellan; cabinet photograph of young Cleo by the Burkholder studio of Mt. Vernon, Ohio. Thomas Popham; cabinet photograph by the Philip Edward Chillman studio of 914 Arch Street, Philadelphia, Pennsylvania. His photograph is faced by the cabinet photograph of Lydia Popham, also by the Chillman studio. I believe they were Thomas Popham (1822-1902) and Lydia (Britton) Popham (1826-1895), Ohio natives who moved to Philadelphia, Pennsylvania. Lydia Popham; cabinet photograph by the Philip Edward Chillman studio of 914 Arch Street, Philadelphia, Pennsylvania. Her photograph is faced by the cabinet photograph of Thomas Popham, also by the Chillman studio. I believe they were Lydia (Britton) Popham (1826-1895) and Thomas Popham (1822-1902), Ohio natives who moved to Philadelphia, Pennsylvania. Cabinet photograph of an unidentified man; by the Philip Edward Chillman studio of Philadelphia, Pennsylvania. 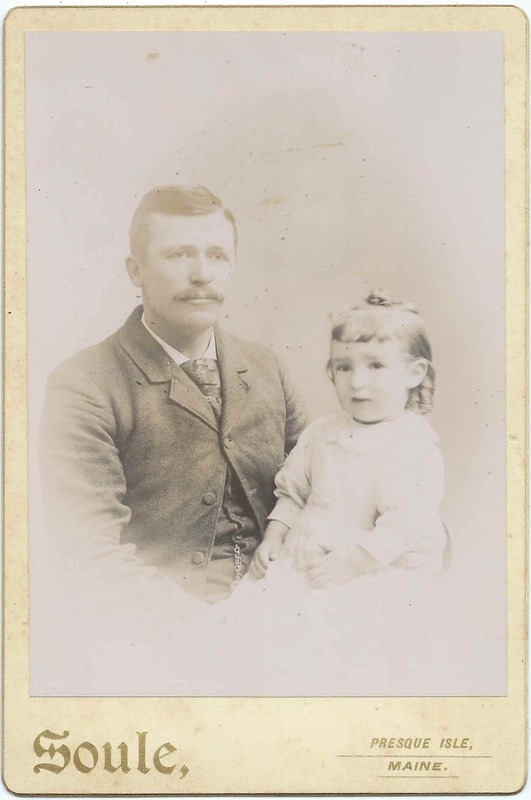 From another photograph by the Chillman studio, I believe the man is Thomas Popham. Flora Reed; cabinet photograph by the Ward studio of Mt. Vernon, Ohio. Her photograph faces that of A. J. Frasher, also by the Ward studio. They were Flora Mae Reed and her future husband Andrew Jackson Frasher. Flora Reed. 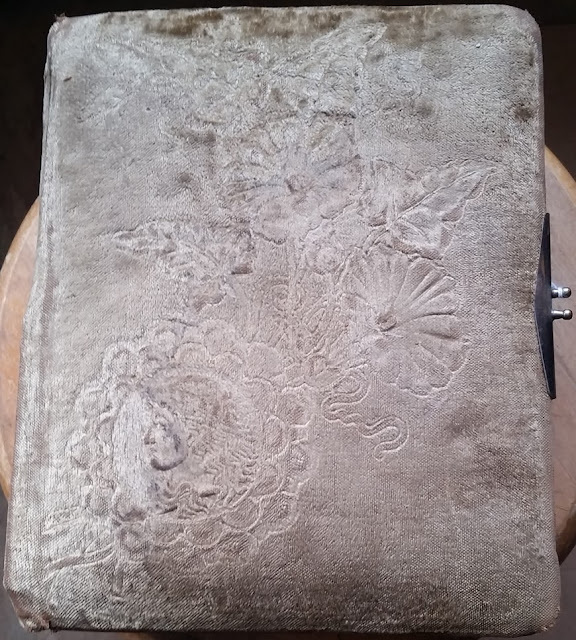 The page contains identification for Cecilia S. K? but the cabinet photograph is of a woman identified on the reverse as Flora Reed, who was presumably Flora Mae Reed (1868-1937), younger sister of Lewis Britton Reed and future wife of Andrew Jackson Frasher. No studio imprint. 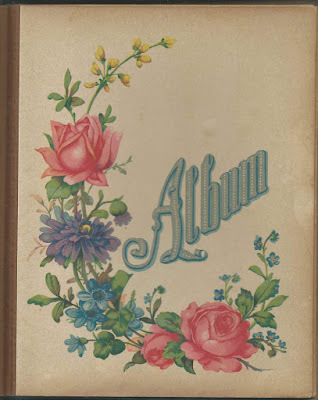 The album measures approximately 10-1/4" by 8-1/2" and contains 32 photographs, most of them identified on the page they are tucked into and some with added information, such as death dates. An alphabetical list of the people identified in the album appears at the end of this post. 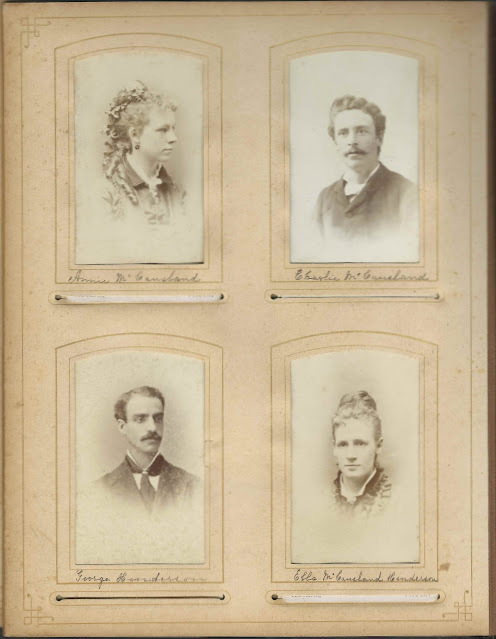 There are five photographs of people with the surname McCausland, whether birth surname or married name: Annie McCausland; Charlie McCausland; Ella McCausland - and husband George Henderson; Eva McCausland; and George McCausland. The next largest group of surnames is Hartt: Mrs. Hartt; Archie Hartt; and Stella Hartt with Guy Sanderson, tintype shown below. 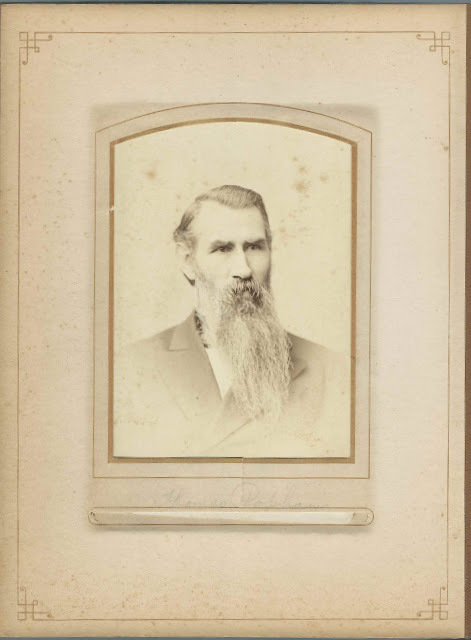 One of the photographs is a carte de visite of Rev. 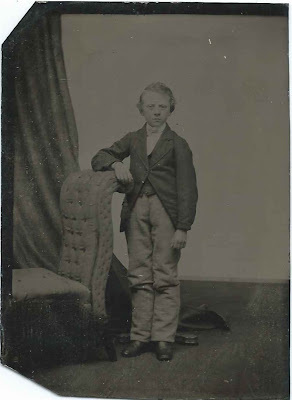 George Frederick Currie, son of Zebulon Currie and Lavinia (Turney) Currie. Rev. Currie was born at Fredericton, New Brunswick, in 1844 and died while on a mission to India on July 30, 1886. His death date is written on the carte de visite. Read more about Rev. Currie's mission to India here. Rev. 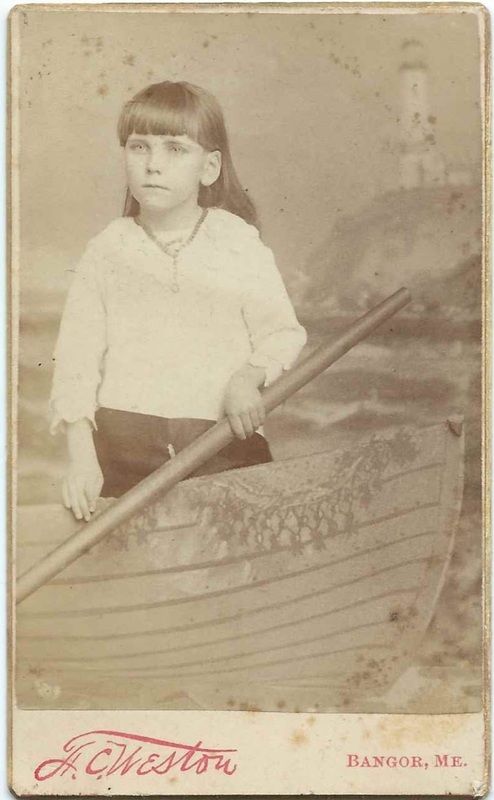 Currie's photograph shares a page with that of young Edith Currie, who I believe was his niece, daughter of Dr. Thomas Turney Currie. Unidentified Photos - click on an image to enlarge it - please comment if you recognize any of these people from your family photographs and/or research. 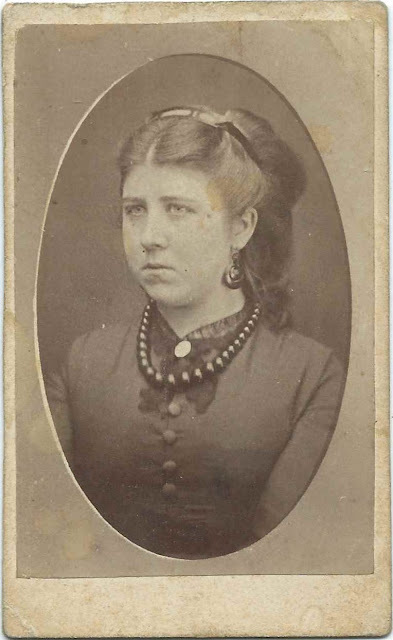 Edith Currie, girl; CDV by the J. P. Tuck studio of Fredericton, New Brunswick. She may have been the Edith Currie was born in 1855, daughter of Thomas Turney Currie, M.D., a brother to Rev. George Frederick Currie, who may have been the Rev. 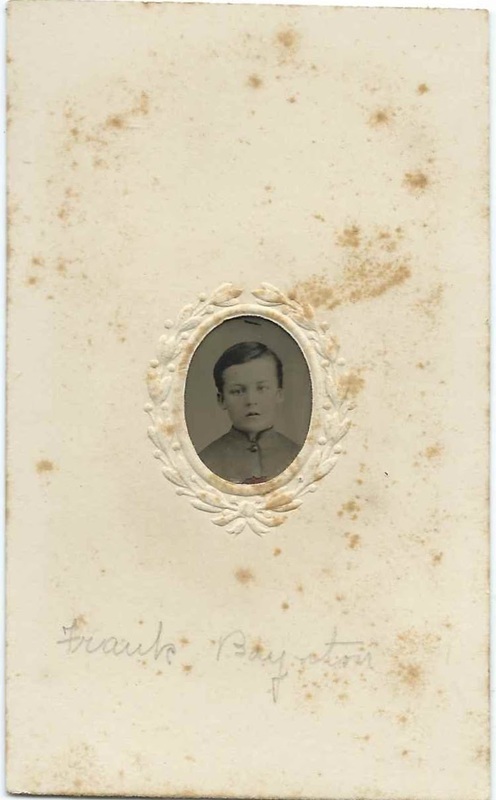 Fred Currie whose CDV is also in the album. Rev. 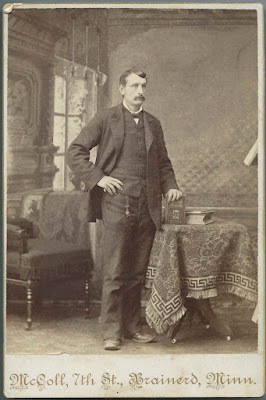 Fred Currie; CDV by the J. P. Tuck studio of Fredericton, New Brunswick. Rev. George Frederick Currie, who died as a missionary in India on that date. He was born in 1844 in New Brunswick, the son of Zebulon Currie and Lavinia (Turney) Currie and was later the stepson of Mary W. (Alford ?) Barker Currie. 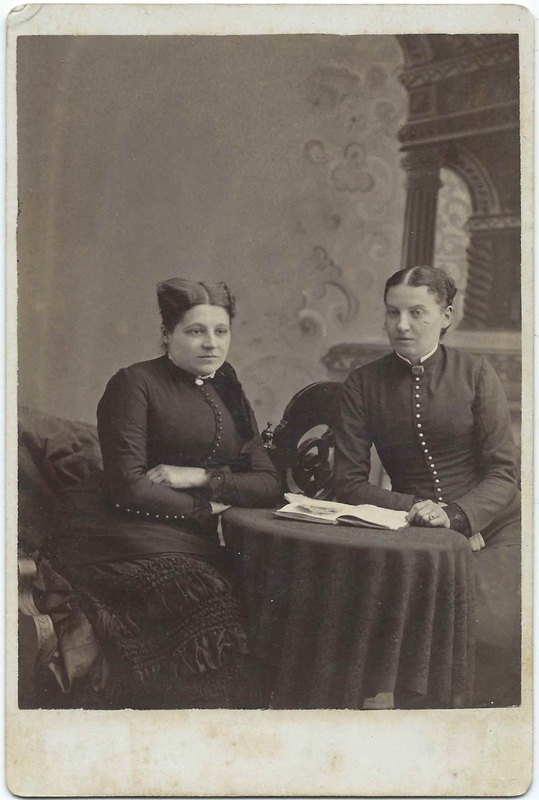 Two people named Barker have photographs in the album: Nettie Barker and Annie G. Barker Estey. Read about Rev. Currie's mission to India here. If you have corrections to the information above or can identity any of the unidentified people, please leave a comment or contact me directly. 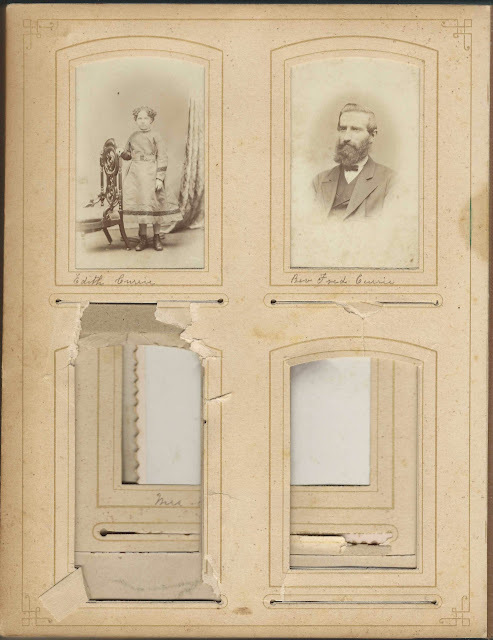 Large photograph album of cabinet photographs, cartes de visite, tintype, newspaper clippings and a memorial card, pertaining to the photogenic Dunphy and Jenkins families of Piscataquis County, Maine. The surname Dunphy has several variants, including Dunphey, Dumphy, Dumphee, etc. scrap of paper with handwritten death information of Stephen Garland; Albina S. Garland and Olevia (Garland) Dunphy. An alphabetical surname list and an alphabetical list of the people identified in the photographs or mentioned in the newspaper clippings appear at the end of this post. 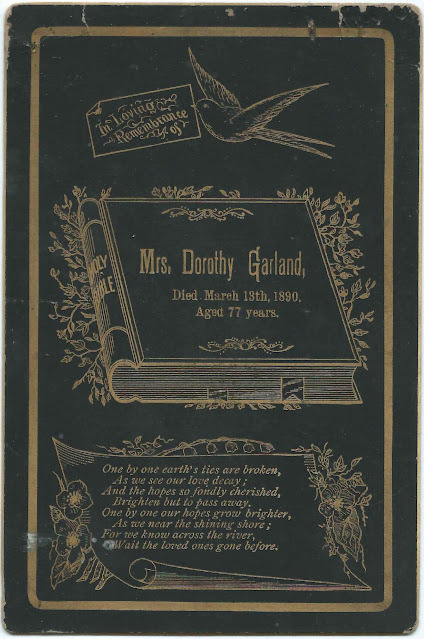 The marriage notices, obituary, handwritten death information, a poem and the tintype of a young girl were found in a handmade envelope tucked between the CDV of an unidentified woman and the memorial card of Mrs. Dorothy Garland, who died March 13, 1890. 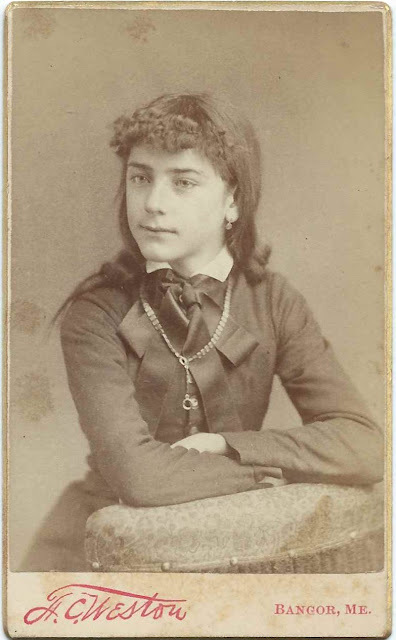 The woman in the CDV, taken by the J. T. Morrison studio of Dover, Maine, may have been Dorothy's daughter, Marcia Olevia (Garland) Dunphy. The little envelope is a treasure. 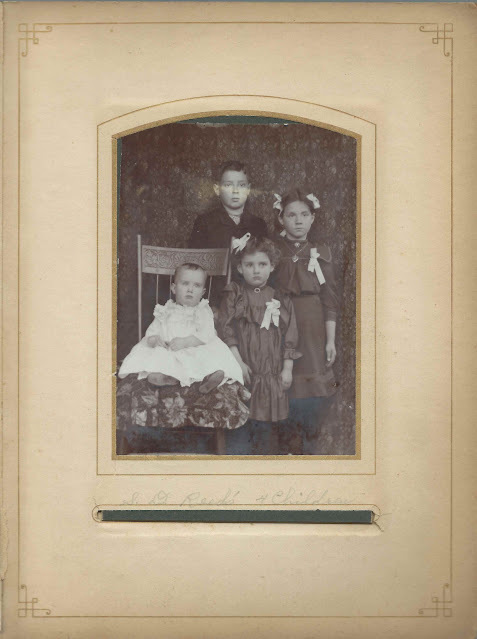 The first cabinet photo in the album is identified on the album page as Marcia Olevia (Garland) Dunphy, (1842-1895), daughter of Stephen Garland, Jr., and Dorothy Jane (Cook) Garland and wife of Benjamin Franklin Dunphy. 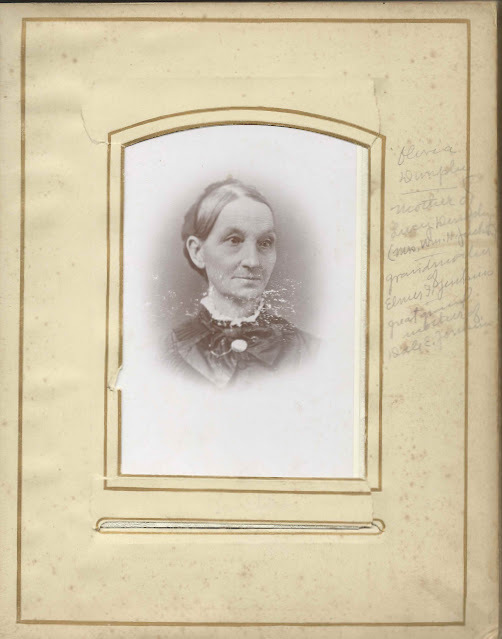 The album contains photographs of her children and grandchildren; one of the unidentified people in the album might have been her husband, Benjamin Franklin Dunphy. The obituary of Olevia's father, Stephen Garland, Jr., mentions a pond on the Garland farm at Sebec, Maine, which was presumably what is now known as Garland Pond. See a map of Garland Pond at the end of this post. Mr. Stephen Garland, a long time resident of Sebec, died at his home in that town Friday, June 8, aged 79 years, 8 months and 13 days. The deceased was born in New Durham, Strafford county, N.H., where he learned the trade of house carpenter. He removed to Exeter, Me., in 1833, where he superintended the erection of the elegant and subsantial residence of the late Col. Frank Hill, then thought to be the best in Penobscot county outside of Bangor. Here he married Miss Dorothy Cook, who had preceded him from his native State. In 1836 he purchased land in Sebec, moved his family onto the premises, cleared away the rough places and made a home which he enjoyed for fifty-eight years without change. 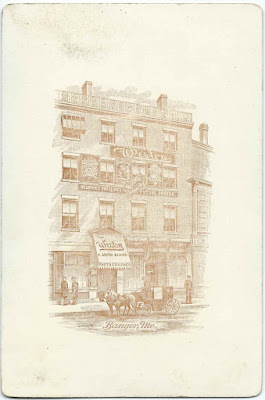 His wife died in the winter of 1890, and since that to him sad event, his last years were solaced by the society and kindly ministrations of a daughter, Mrs. B. F. Dunphy, in his own household. A second daughter, Mrs. Francis Parkman of Sebec, with Mrs. Dunphy, are sole survivors of the family. He leaves no son to pertetuate his name, but that will long live in the beautiful and romantic lakelet covering a part of the farm, which bears it, and fast becoming a favorite quiet resort of veterans of the late war, Sunday School children and others. Mr. Garland was long known among his townsmen, neighbors and acquaintances as a man of exemplary character in every respect, of the strictest integrity in all his dealings, and enjoying the confidence and respect of all who knew him in a remarkable degree. A good citizen and upright man has left us. Several of the identified people in the album are further identified to note their relationship to Olevia's grandson, Elmer Franklin Jenkins, son of Olevia's daughter Lucy E. (Dunphy) Jenkins and William Horatio Jenkins. It would appear that the album passed on to Lucy, then Elmer and to his descendants before being lost to the family. People in the photographs or mentioned in the mementos - 26 people are not identified but the identities of several can be guessed because of their resemblance or placement in the album. Cabinet photograph of unidentified baby; by the Chase studio of Foxcroft, Maine. 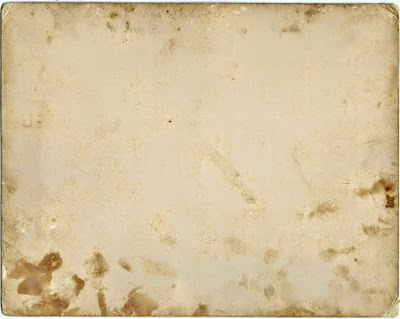 Whether significant or not, the baby's photograph faced a photograph of Sarah M. (Dunphy) Pearl, daughter of Benjamin F. Dunphy and Marcia Olevia (Garland) Dunphy and wife of John Pearl. Unidentified middle-aged woman; cabinet photograph by the A. H. Dinsmore studio of Dover, Maine. Unidentified baby; cabinet photograph by the Chase studio of Foxcroft, Maine. Whether a coincidence or not, the photograph faces one of Lillian Abbie (Mitchell) Jenkins, wife of Charles Sumner Jenkins. They had at least two children: Leonard Horatio Jenkins and Carrie F. Jenkins. Unidentified man; cabinet photograph by the Chase studio of Foxcroft, Maine. His photograph, whether coincidence or not, faces a cabinet photograph of Mabel F. Dunphy, who would become the second wife of Julius Everett Parkhurst. He's wearing a name tag. Unidentified man; cabinet photograph with no studio imprint. CDV of an unidentified middle-aged woman; by the J. T. Morrison studio of Dover, Maine. 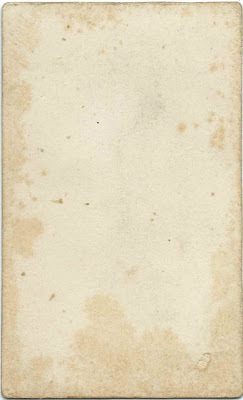 The pocket for this CDV and a Memorial card for Mrs. Dorothy Garland, who died March 13, 1890 at the age of 77 have a surprise tucked between them, a little homemade envelope full of clippings of deaths, marriages, etc. Could this woman be Marcia Olevia (Garland) Dunphy or her sister Miss Albina S. Dunphy? Tintype of an unidentified girl. Tucked in a homemade envelope with other items relating to the Garland and Dunphy families of Sebec, Maine. Charley; CDV by the J. T. Morrison studio of Dover, Maine. He may have been Charles E. Dunphy, son of Benjamin Franklin Dunphy and Marcia Olevia (Garland) Dunphy. 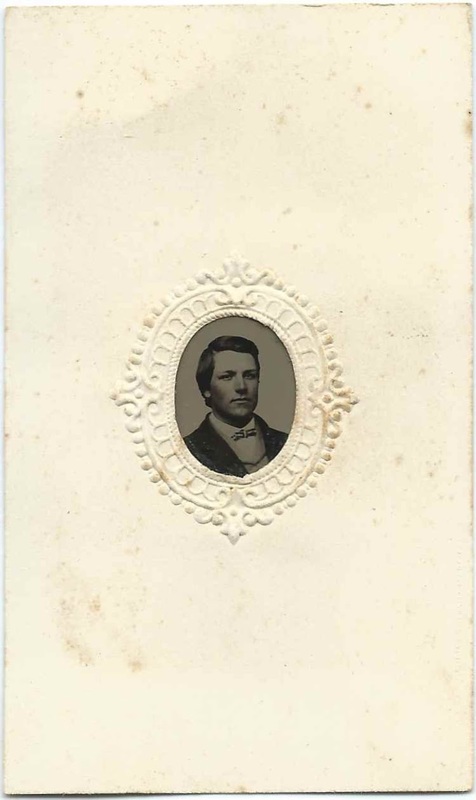 CDV of an unidentified young man; by the D. C. Dinsmore studio of Dover, Maine. John Astrom; newspaper clipping noting his 1895 marriage to Adela Elizabeth Sandberg; marriage performed at Brownville, Maine on Oct. 26th by Rev. W. C. Curtis. Tozy Bearce, wife of Charles Bearce, aged about 70 years. Tozy was Torsella (Gilbert) Bearce. Nathan Chase of Bangor, Maine; newspaper clipping noting his 1895 marriage to Miss Lydia M. Inman of Orono, Maine; marriage performed in Orono, Maine, by Rev. Mr. Robinson. Harvey J. Cross of Sebec, Maine; newspaper clipping noting his 1895 marriage to Florence M. Pratt of Sebec; marriage performed at the F.B. Parsonage at Dover, Maine, on October 23d by Rev. W. L. Nickerson. A cabinet photograph of Florence M. (Pratt) Cross Scales appears in the album. Marcia Olevia (Garland) Dunphy, "Olevia", mother of Lucy E. Dunphy (Mrs. William Horatio Jenkins); grandmother of Elmer Franklin Jenkins; great grandmother of Dale E. Jenkins. Cabinet photograph by the Chase studio of Foxcroft, Maine. Charles E. Dunphy, uncle of Elmer Franklin Jenkins. Charles was the son of Benjamin F. Dunphy and Marcia Olevia (Garland) Dunphy and sister of Lucy E. (Dunphy) Jenkins, mother of Elmer Franklin Jenkins. Cabinet photograph by the Chase studio of Foxcroft, Maine. Cabinet photograph by the Chase studio of Foxcroft, Maine. Mabel F. (Dunphy) Parkhurst, aunt of Elmer Franklin Jenkins. She was the daughter of Benjamin F. Dunphy and Marcia Olevia (Garland) Dunphy and sister of Lucy E. (Dunphy) Jenkins, mother of Elmer Franklin Jenkins. She married J. Everett Parkhurst on September 23, 1903 at Lewiston, Maine. Cabinet photograph by the Unidentified baby; cabinet photograph by the Chase studio of Foxcroft, Maine. Whether a coincidence or not, the photograph faces one of Lillian Abbie (Mitchell) Jenkins, wife of Charles Sumner Jenkins. They had at least two children: Leonard Horatio Jenkins and Carrie F. Jenkins. Chase studio of Foxcroft, Maine. 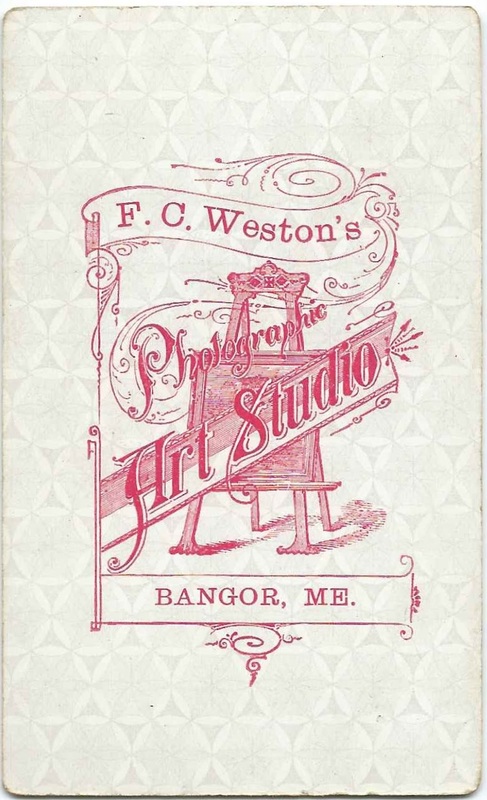 She appears in another photograph by the Dinsmore studio of Dover, Maine. 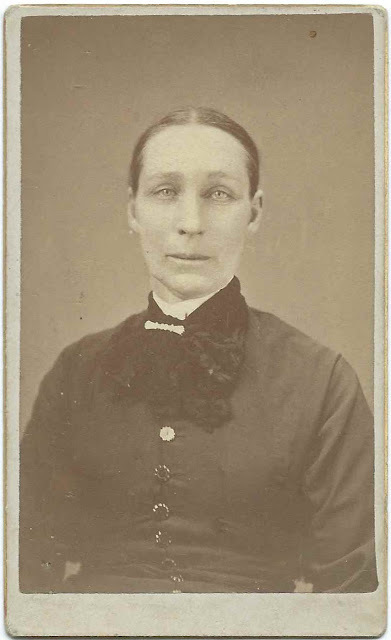 Sarah M. (Dunphy) Pearl, daughter of Benjamin F. Dunphy and Marcia Olevia (Garland) Dunphy and wife of John Pearl, whom she married on March 24, 1894 at Sebec, Maine. Maine Marriage Record shows her surname as Dumphee. Cabinet photograph by Chase studio of Foxcroft, Maine. "Jennie", Mrs. Stephen Dunphey. She was Jennie E. (Vanidestine) Dunphy, wife of Stephen Andrew Dunphy, who was the son of Benjamin F. Dunphy and Marcia Olevia (Garland) Dunphy. Cabinet photograph; no studio imprint. 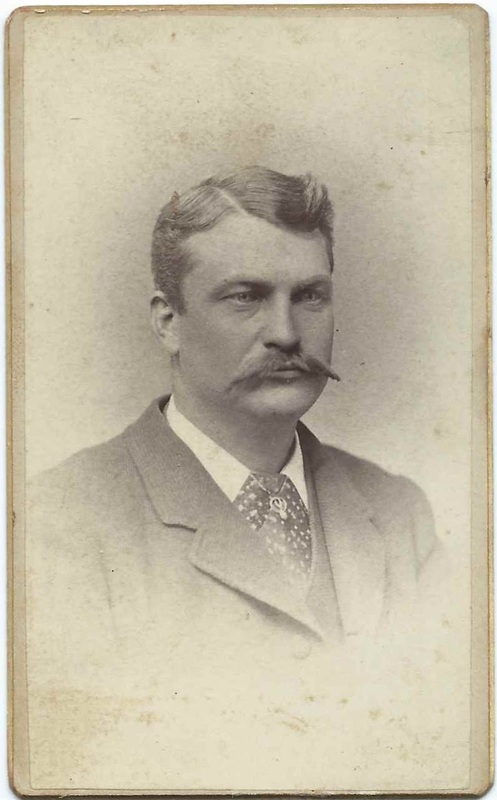 Her photograph faces that of her husband, Stephen Andrew Dunphy. 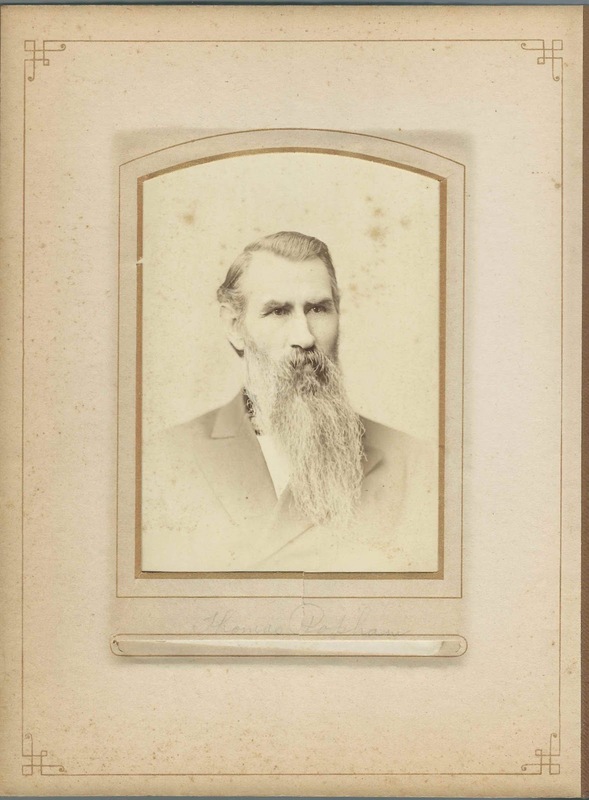 "Stephen Dunphy, uncle of E. F. J.". He was Stephen Andrew Dunphy, brother of Lucy E. (Dunphy) Jenkins, who was the mother of Elmer Franklin Jenkins. Cabinet photograph; no studio imprint. Stephen's photograph faces one of his wife Jennie E. (Vanidestine) Dunphy. "Lewis Dunphy, Uncle of E. F. J.". 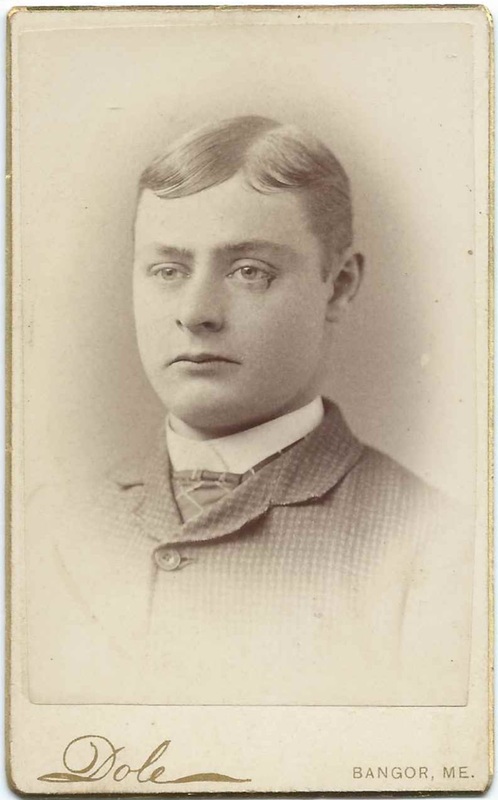 Lewis E. Dunphy, son of Benjamin F. Dunphy and Marcia Olevia (Garland) Dunphy and brother to Lucy E. (Dunphy) Jenkins, mother of Elmer Franklin Jenkins. Cabinet photograph; no studio imprint. "Mabel Dunphy"; by the Dinsmore studio of Dover, Maine. 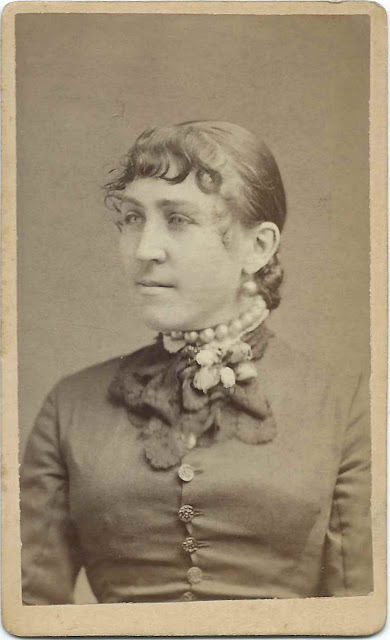 Presumably Mabel F. (Dunphy) Parkhurst before her marriage. She was the daughter of Benjamin Franklin Dunphy and Marcia Olevia (Garland) Dunphy. 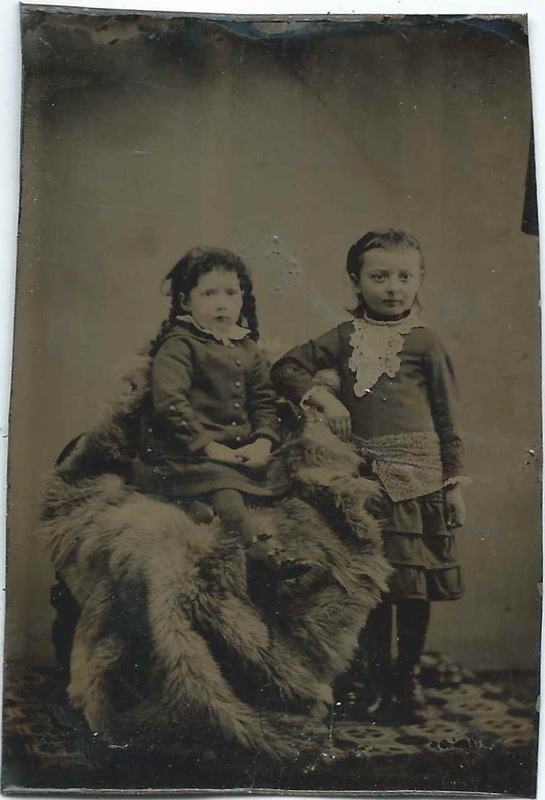 There's another photograph of Mabel in the album. Charles E. Dunphey of Sebec, Maine; newspaper clipping noting his 1895 marriage to Luna A. Gray of Sebec, Maine [the clipping spells her name erroneously as Lena]; marriage performed at Sebec, Maine on Oct. 26th by H. J. Cross, Esq. Charles E. Dunphey, "Charlie", was the son of Benjamin Franklin Dunphey and Marcia Olevia (Garland) Dunphy. 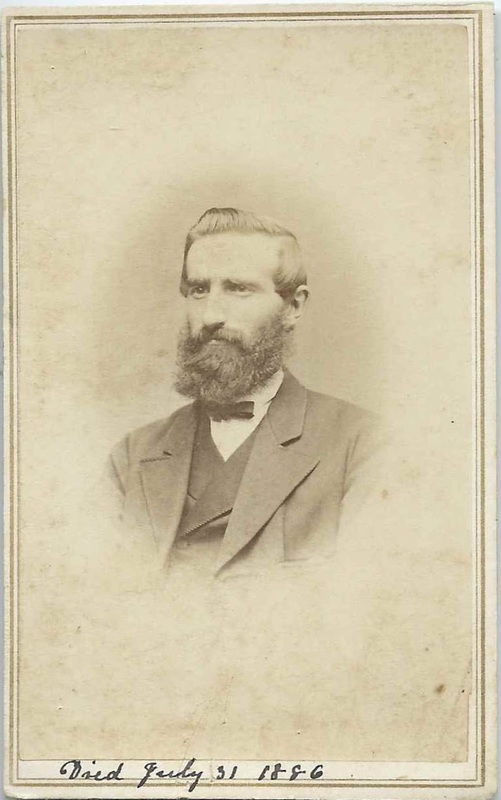 A CDV of Charlie appears in the album. "Mrs. Olevia M. Dunphy; One side of a scrap of paper with information on the death and age at death of Mrs. Olevia M. Dunphy, tucked into a homemade envelope in the album pocket between a CDV of an unidentified middle-aged woman taken by the J. T. Morrison studio of Dover, Maine; and a memorial card for Mrs. Dorothy Jane (Cook) Garland of Sebec, Maine, wife of Stephen Garland, Jr., who outlived her. The other side has death information for her father Stephen Garland, Jr., and her sister, Albina S. Garland. ""Mrs. Olevia M. Dunphy, Died October 31, 1895. Age 53 years, 9 months, 21 days."" The other side contains entries about the death of Olevia's father Stephen Garland, Jr., and her sister Albina S. Garland." Herbert L. Galusha; newspaper clipping noting his 1895 marriage to Miss Ada M. Hill, both of Dover, Maine; marriage performed at the home of the bride's sister, Mrs. L. A. Ayer at Dover, Maine, on October 26 by Rev. P. B. Thayer. Stephen Garland of Sebec, Maine; his obituary. He died June 8, 1894. Father of Marcia Olevia (Garland) Dunphy. 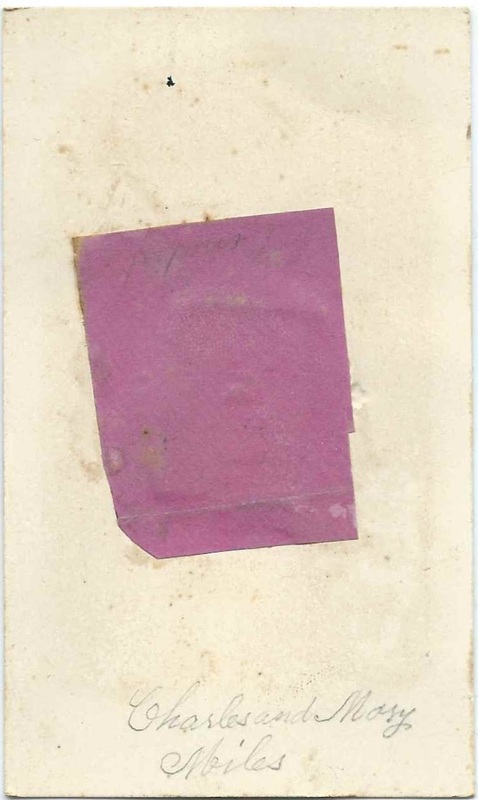 Stephen Garland, Jr., of Sebec, Maine: One side of a scrap of paper tucked into a homemade envelope in the album pocket between a CDV of an unidentified middle-aged woman taken by the J. T. Morrison studio of Dover, Maine; and a memorial card for Mrs. Dorothy Jane (Cook) Garland of Sebec, Maine, wife of Stephen Garland, Jr., who outlived her. "Mr. Stephen Garland, Died June 8, 1894, age 79 years, 8 mo., 13 days. Miss Albina S. Garland, Died 1893"; daughter of Stephen Garland, Jr., and Dorothy Jane (Cook) Garland. 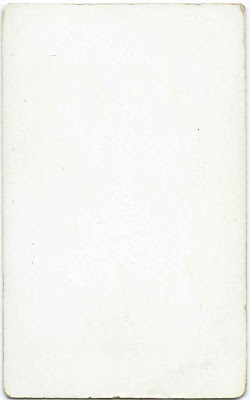 "Miss Albina S. Garland of Sebec, Maine; One side of a scrap of paper tucked into a homemade envelope in the album pocket between a CDV of an unidentified middle-aged woman taken by the J. T. Morrison studio of Dover, Maine; and a memorial card for Mrs. Dorothy Jane (Cook) Garland of Sebec, Maine, wife of Stephen Garland, Jr., who outlived her. Mr. Stephen Garland, Died June 8, 1894, age 79 years, 8 mo., 13 days. Miss Albina S. Garland, Died 1893"". Albina was the daughter of Stephen Garland, Jr., and Dorothy Jane (Cook) Garland." Luna A. 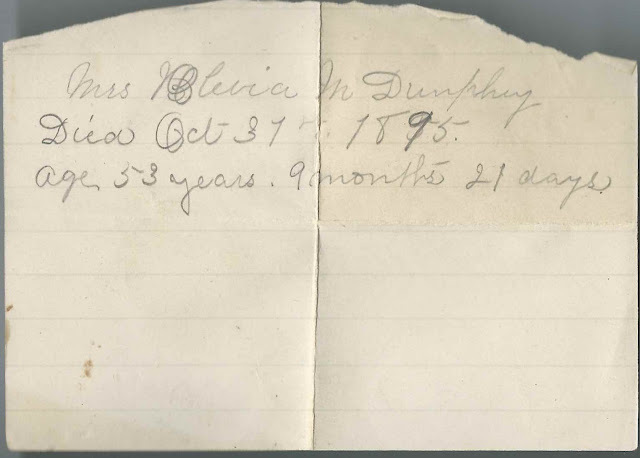 Gray of Sebec, Maine [the clipping spells her name erroneously as Lena].newspaper clipping noting her 1895 marriage to Charles E. Dunphey; marriage performed at Sebec, Maine on Oct. 26th by H. J. Cross, Esq. Charles E. Dunphey, "Charlie", was the son of Benjamin Franklin Dunphey and Marcia Olevia (Garland) Dunphy. 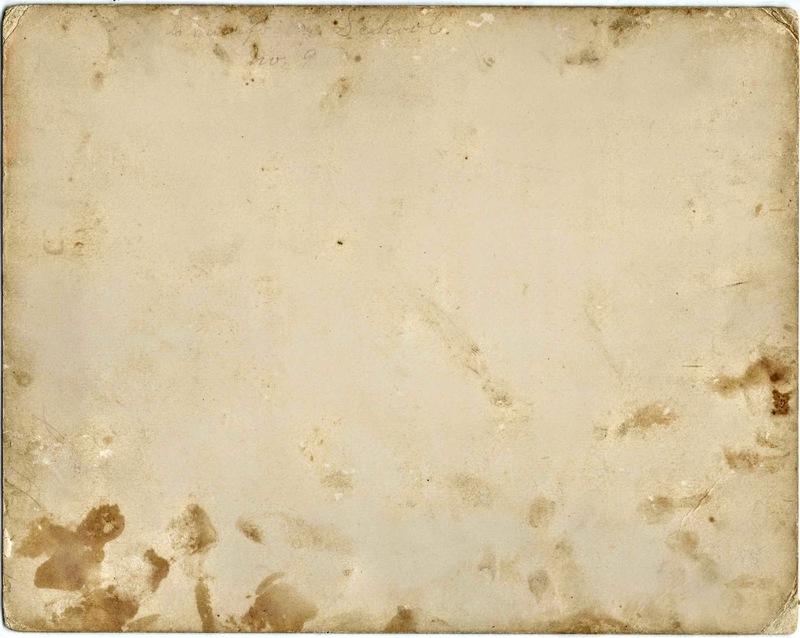 A CDV of Charlie appears in the album. Miss Lydia M. Inman of Orono, Maine; newspaper clipping noting her 1895 marriage to Nathan Chase of Bangor, Maine; marriage performed in Orono, Maine, by Rev. Mr. Robinson. 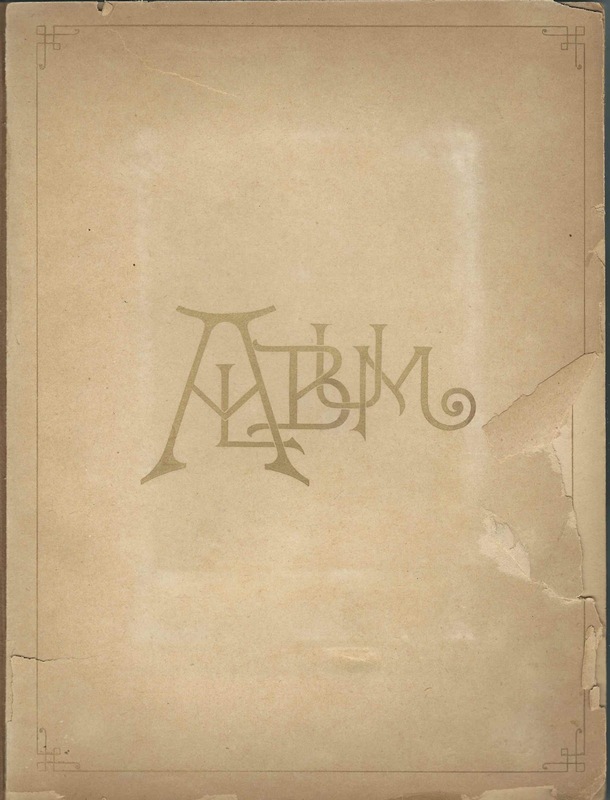 Elmer F. Jenkins; no studio imprint. 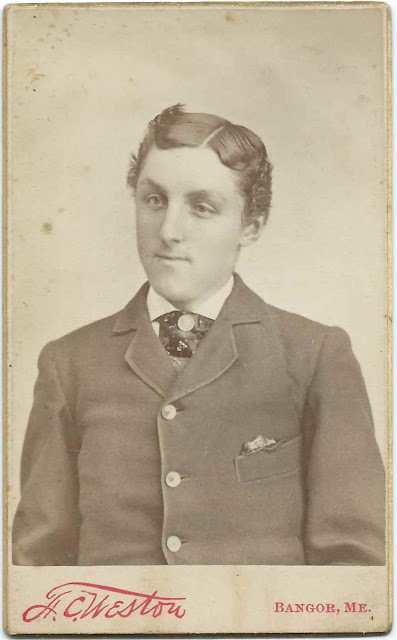 Son of William Horatio Jenkins and Lucy E. (Dunphy) Jenkins. Cabinet photograph; no studio imprint. "Lillian Jenkins, wife of Charles J. (brother of Wm. H. Jenkins)". Presumably Lillian Abbie (Mitchell) Jenkins, wife of Charles Sumner Jenkins. Cabinet photograph by the Chase studio of Foxcroft, Maine. Elmer Jenkins; CDV by the D. C. Dinsmore studio of Dover, Maine. Elmer Franklin Jenkins, son of William Horatio Jenkins and Lucy E. (Dunphy) Jenkins and brother of Annie M. Perkins, whose CDV shares the same pocket in the album. "Horatio Jenkins, father of Wm. 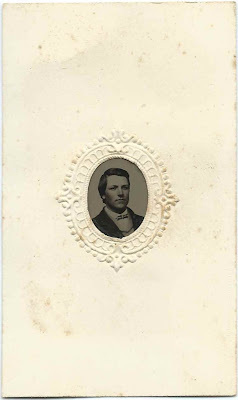 H. Jenkins, father of Elmer F. Jenkins"; CDV by the Morrison studio of Dover, Maine. 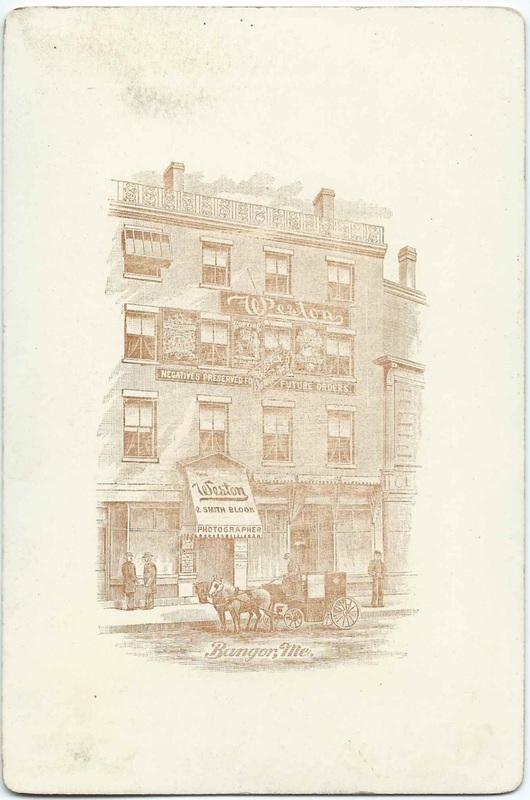 Horatio may have been the Horatio Jenkins who was born at Monroe, Maine, on April 3, 1831, son of Dennis Jenkins and Mary J. (Davis) Jenkins. The Jenkins family was living at Kilmarnock in Piscataquis County, Maine, by the time of the 1850 Census. William H. Newman; newspaper clipping noting his 1895 marriage to Mabel D. Brockway of Pittsfield, Maine; marriage performed in Foxcroft, Maine, by Rev. H. R. Mitchell. Mrs. Josie M. Plummer of Dover, Maine; newspaper clipping noting her 1895 marriage to William Wellington of Dover, Maine; marriage performed at Dover, Maine, at the M.E. Parsonage by Rev. C. C. Whidden. "Florence (Mrs. N. Scales, cousin of Lucy Jenkins". Florence was Florence Marion (Pratt) Cross Scales, wife of Nelson N. Scales. Florence Marion (Pratt) Cross Scales was born July 19, 1877 at Foxcroft, Maine, daughter of Charles W. Pratt and Frances Jane (Garland) Pratt. 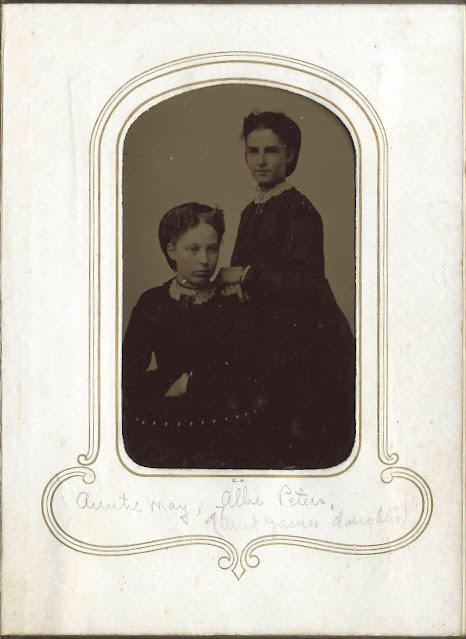 Frances Jane (Garland) Pratt and Maria Olevia (Garland) Dunphy, mother of Lucy E. (Dunphy) Jenkins, were sisters. 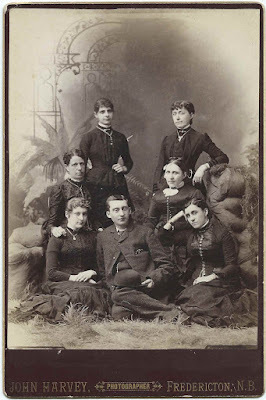 Cabinet photograph by the C. R. Smith Photo Co.
Florence M. Pratt of Sebec, Maine; newspaper clipping noting her 1895 marriage to Harvey J. Cross of Sebec, Maine; marriage performed at the F.B. Parsonage at Dover, Maine, on October 23d by Rev. W. L. Nickerson. A cabinet photograph of Florence M. (Pratt) Cross Scales appears in the album. "Austin Pratt, Aged 71"; CDV by the D. C. Dinsmore studio of Dover, Maine. 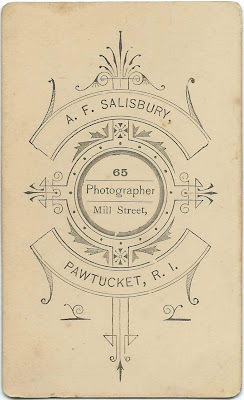 Presumably Austin Gurney Pratt born December 26, 1811 at Hebron, Maine, Maine, son of William and Martha (Gurney) Pratt. Austin married Betsey Davee Barrows. Adela Elizabeth Sandberg; newspaper clipping noting her 1895 marriage to John Astrom; marriage performed at Brownville, Maine on Oct. 26th by Rev. W. C. Curtis. Mrs. Abbie L. Taylor of Sebec; newspaper clipping noting her 1895 marriage to James P. Young of Sebec, Maine; performed at Foxcroft, Maine, on October 23d. 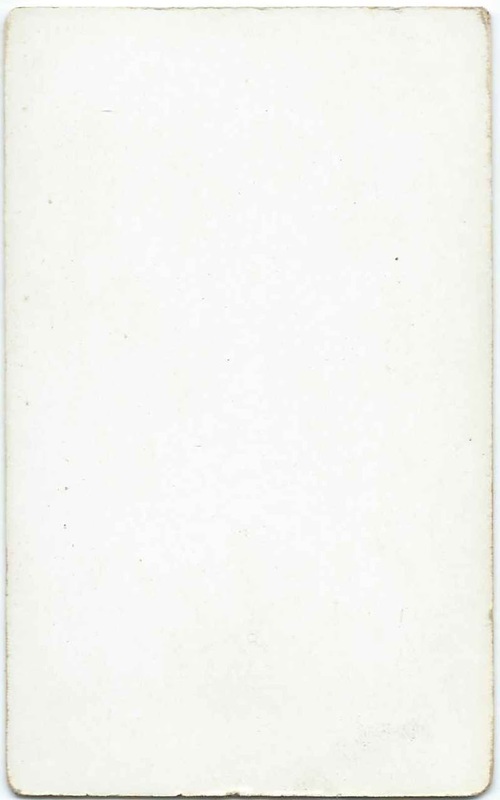 Dr. Thomas; his name on a prescription ordered on December 27, 1888 from C. H. French, Druggist. William Wellington of Dover, Maine; newspaper clipping noting his 1895 marriage to Mrs. Josie M. Plummer of Dover, Maine; marriage performed at Dover, Maine, at the M.E. Parsonage by Rev. C. C. Whidden. James P. Young of Sebec, Maine; newspaper clipping noting his 1895 marriage to Mrs. Abbie L. Taylor of Sebec, Maine; marriage performed at Foxcroft, Maine, on October 23d. 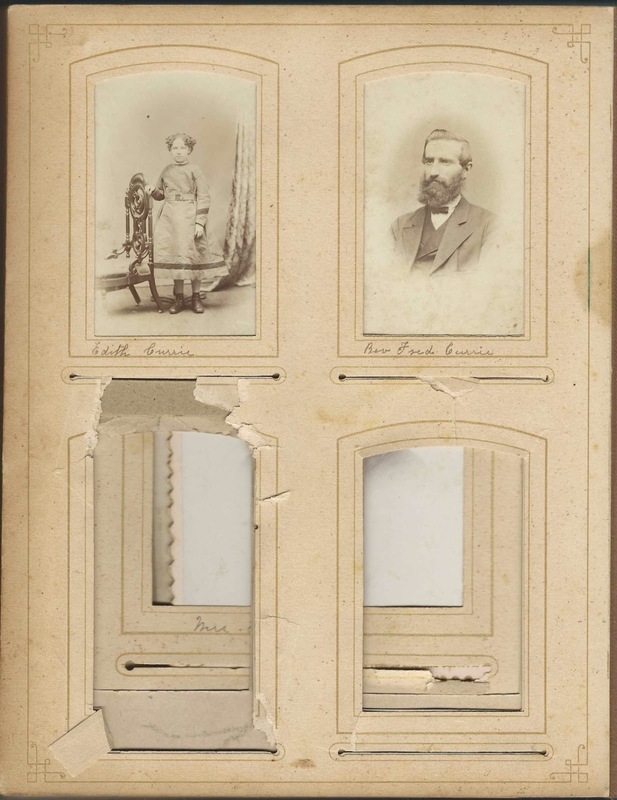 c1870s photograph album with 11 tintypes of the Brown and Miles families of Hinesburg, Vermont and Schoolcraft, Michigan. 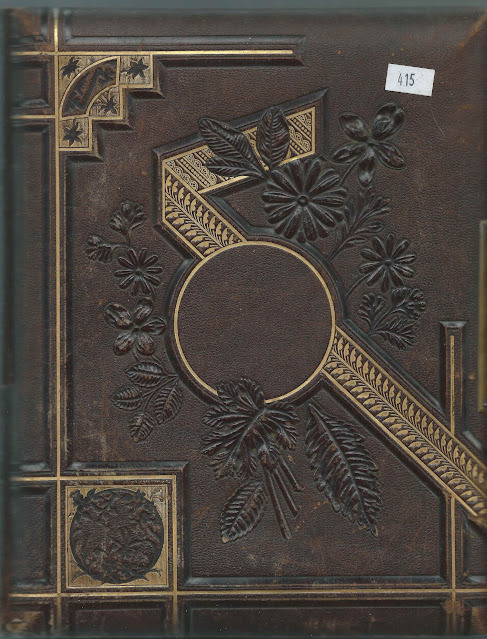 The album measures approximately 5-3/4" by 4" and contains eleven tintypes and gem tintypes. Not everyone is identified, and the identifications appear to have been made after the album was compiled, with at least one mistake. "Addison Brown, Married Aunt Mary Ann, Sister of J. F. Miles". Actually Addison Makepeace Brown was the son of Mary Ann (Miles) Brown, second wife of Ebenezer Lakin Brown. Mary Ann (Miles) Brown was the sister of Dr. John Fay Miles. Addison Makepeace Brown married Mollie Eliza Earl in 1885. "Ella Livermore, her mother sister to John Fay Miles". 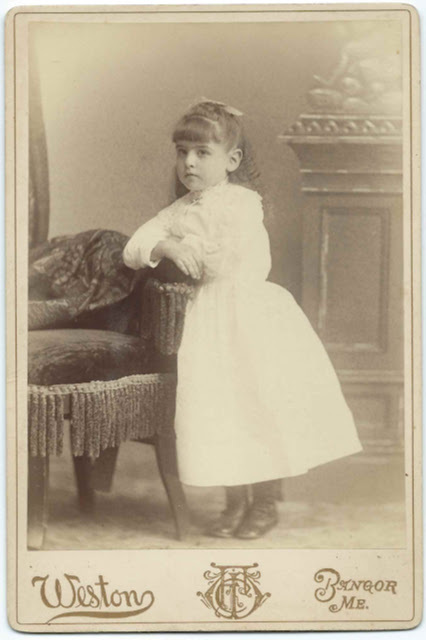 Ella was the daughter of James Livermore and Helen Juliette (Miles) Livermore, who was a sister to Dr. John Fay Miles. "Auntie May, Allie Peters (Aunt James daughter)" - Aunt James could be Aunt Janes; see for yourself in the second image below. Aunt Helen Ray, Grandpa Miles' Sister". Helen (Miles) Ray was born in 1835 at Hinesburg, Vermont, daughter of Nathaniel Miles and Roxalana (Bishop) Miles and wife of Ralph Elmer Ray. She died at Burlington, Vermont in 1880. "Grandpa Miles" was presumably Dr. John Fay Miles. 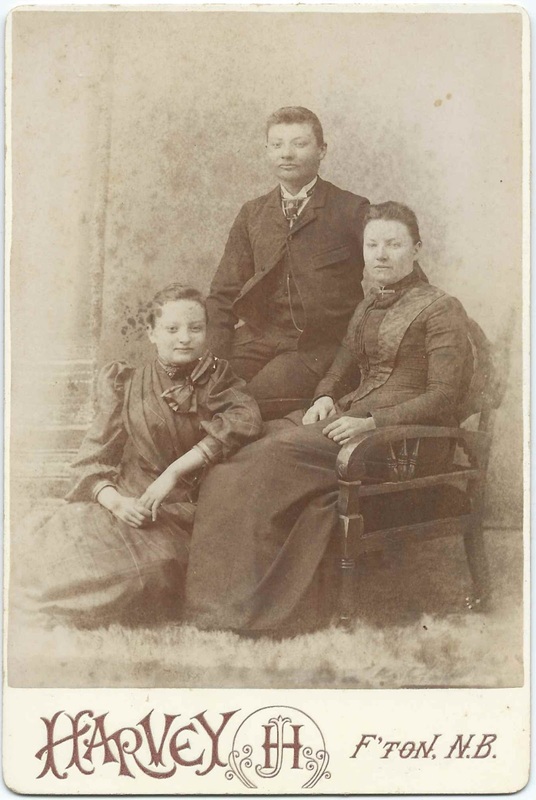 "Addison, Edd, Ada Brown"; pictured below. 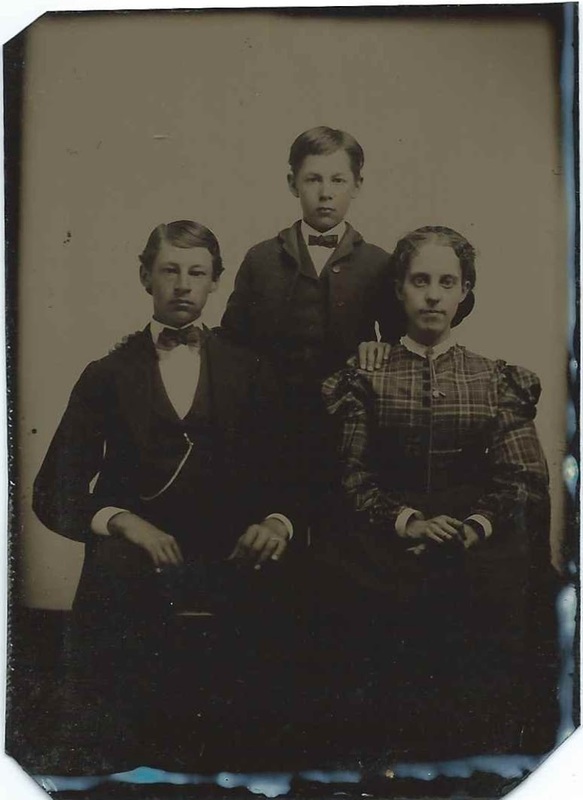 They were the children of Ebenezer Lakin Brown. Ada was Amelia Ada Brown, whose mother was Ebenezer's first wife Amelia W. (Scott) Brown, who died in 1848. Edd and Addison were Edward Miles Brown and Addison Makepeace Brown, whose mother was Ebenezer's second wife Mary Ann (Miles) Brown. "Ada Brown"; Amelia Ada Brown, daughter of Ebenezer Lakin Brown and first wife Amelia W. (Scott) Brown. "Charles and Mary Miles", shown below. Although two people are mentioned on the reverse of the mat of this gem tintype, only one young man is pictured, presumably the Charles Miles mentioned. Charles may have been Charles Noble Miles, born in 1848 at Hinesburg, Vermont, son of Dr. John Fay Miles and Fidelia (Boynton) Miles. Charles married Helen or Ellen J. Burns of New York; he died in 1928 in Idaho. Fittingly, Charles had a sister, Mary Ann Miles. Read the obituary of Addison Makepeace Brown here. Below: "Auntie May, Allie Peters (Aunt James daughter)". If you can tease out the identities of Auntie May and Allie Peters, please leave a comment or contact me directly. 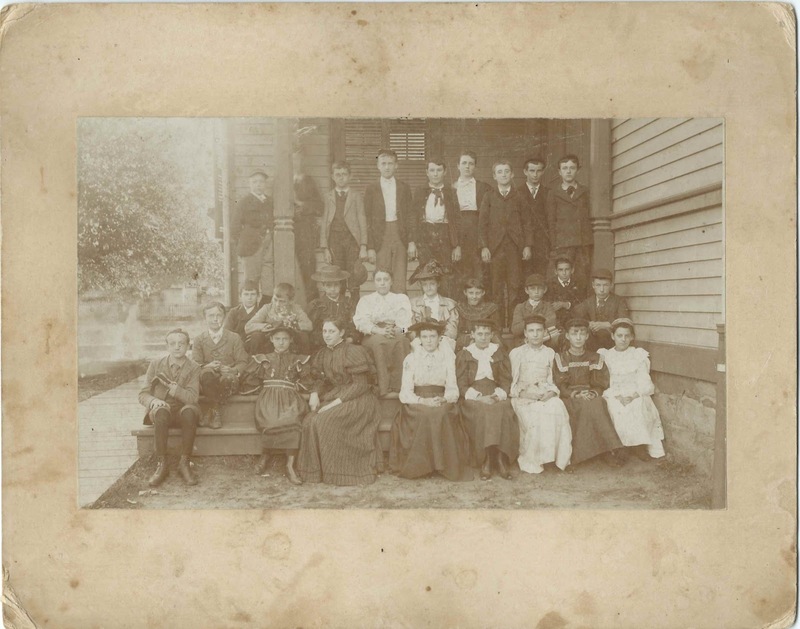 19th century photograph of the students at a school identified on the back as ? School No. 9"; perhaps Cranford School. 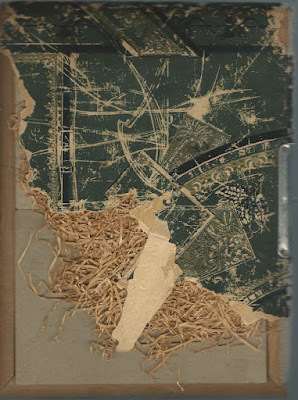 The photograph measures about 8" by 5"; the entire piece measures almost 10" by 8". It was found with a collection of photographs of people, some identified, from Maine, New Brunswick, Michigan and Rhode Island. If you can tease out the name of the school from any of the clues above, please leave a comment or contact me directly. 8 Cartes de Visites of unidentified people. 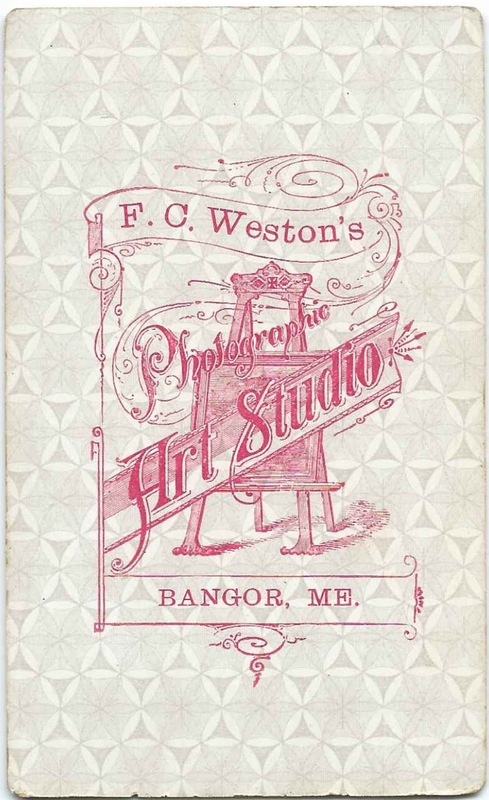 The photographs were taken by studios at Bangor, Maine; Providence, Rhode Island; and Pawtucket, Rhode Island. 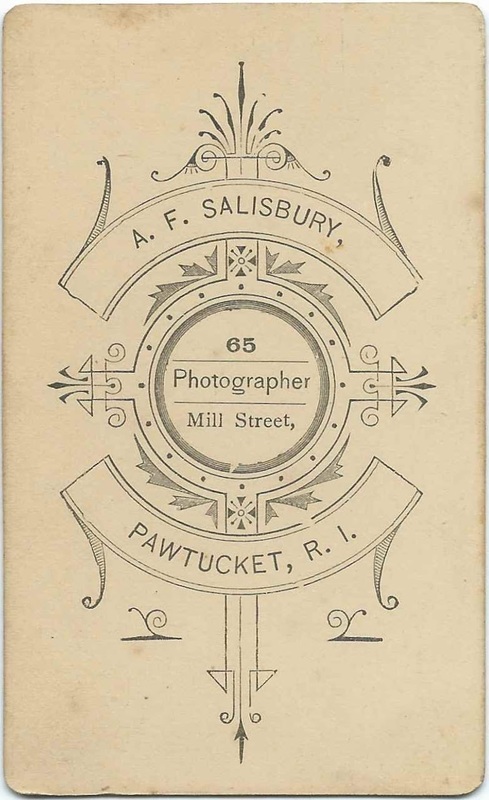 The photographs were found with a memorial card and several other photographs from New Brunswick, Maine and Michigan. 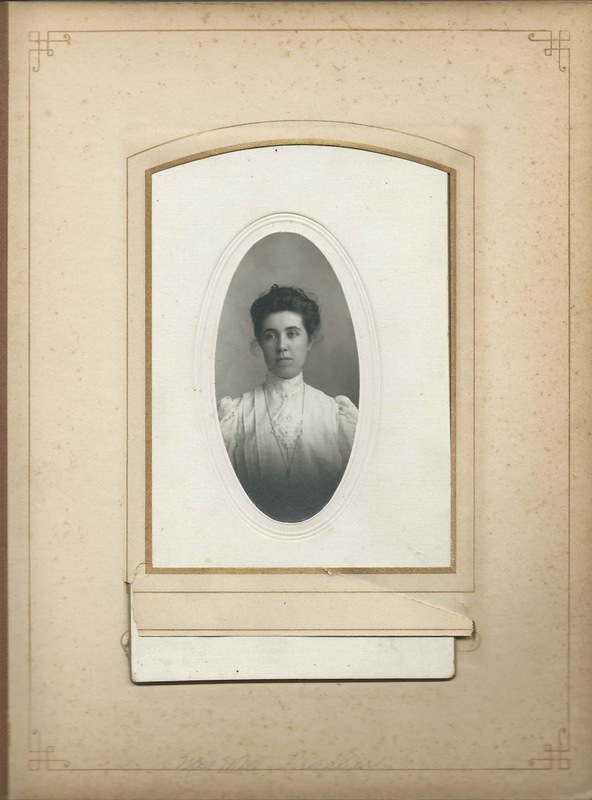 Helen Eola Mayo of Bangor, Maine; granddaughter, presumably, of the David Peavey noted on the memorial card. If you recognize any of the people in the CDVs from your family photographs and/or research, or have an idea of identity based on the locale and clues of the identified people, please leave a comment or contact me directly.